Our first MARVEL character brings us two 4x4 plates, now available in Earth Blue [TLG]/Dark Blue [BL] (Element ID 6027625 | Design ID 3031). He also gives us the third new colour in this series for Plate 1X2 W. 1 Horizontal Snap, now in Reddish Brown (6185998|11476). Even though a different plate is used for his right hand to hold the shield up, you still get two in the set, with one strangely placed on his back. 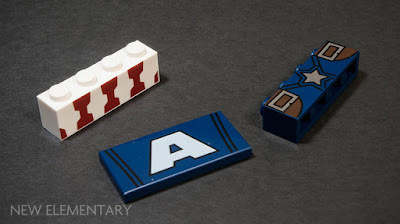 Three elements with exclusive prints for Captain America are an Earth Blue 1x4 brick with his star and torso detail (6188686), an Earth Blue 1x4 Flat Tile with a white letter “A” (6188254) and a White 1x4 Brick with red shapes (6188690). Although I only have one brick on hand, I can use some digital trickery to visualise its 'stackability'. 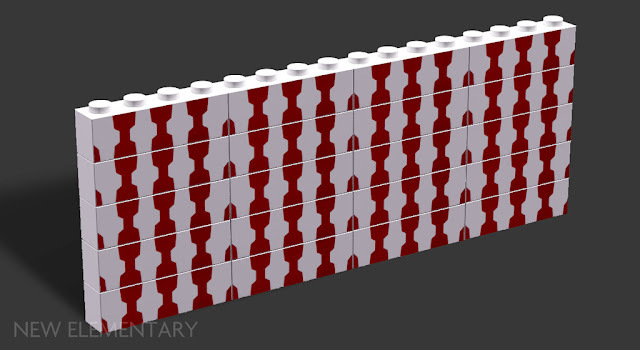 The pattern matches up much better vertically than side by side in my opinion. It isn’t your typical wallpaper, but I leave it to your imagination to find an appropriate scenario where this pattern works. Iron Man introduces yet another recolour of Plate 1X2 W. 1 Horizontal Snap: New Dark Red [TLG]/Dark Red [BL] (6186001|11476). Parts made available in Dark Red now also include Plate 1x2 with rail (6186005|32028) with only one provided in the set, and two 2x4 Tiles (6186003|87079). By the way, in case you are wondering why TLG changed the name of Dark Red to “New Dark Red”, it is because it was indeed new at some point. 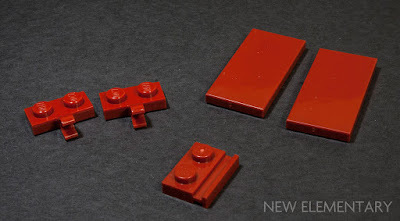 BrickLink doesn’t differentiate Dark Red as two separate colours, and apart from adding “New” to the name, neither does TLG. It isn’t entirely clear when the change was made, but I estimate around 2009/10, with people reporting getting both versions of the same part in the same set. 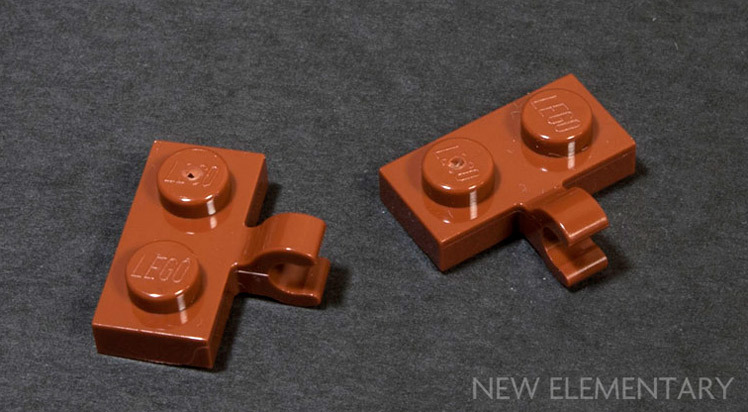 It is unusual how little information can be found about this change, yet I find the difference in colour more distinct than the one between Earth Orange [TLG]/ Brown [BL] (better known as Old Brown) and Reddish Brown. 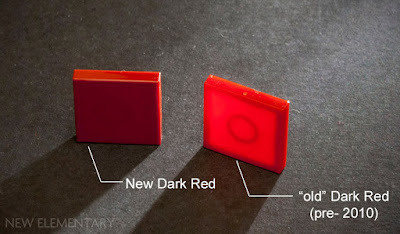 The easiest way to see if your part is “old” Dark Red or New Dark Red is to shine a light through it. 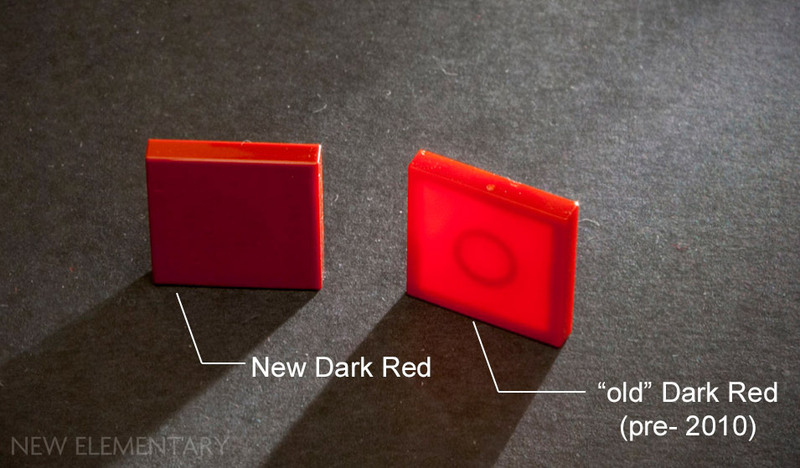 The old Dark Red lets light through and almost looks translucent, while New Dark Red elements are completely opaque. This is especially noticeable on tiles. Back to Iron Man, who also brings us one Plate 1X4 W. 2 Knobs never before seen in Flame Yellowish Orange [TLG]/Bright Light Orange [BL] (6022014|92593). 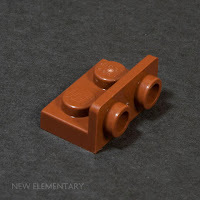 The old “Headlight brick”, Angular Brick 1X1 (6186006|4070) has been seen before in Flame Yellowish Orange but only in a single set four years ago. 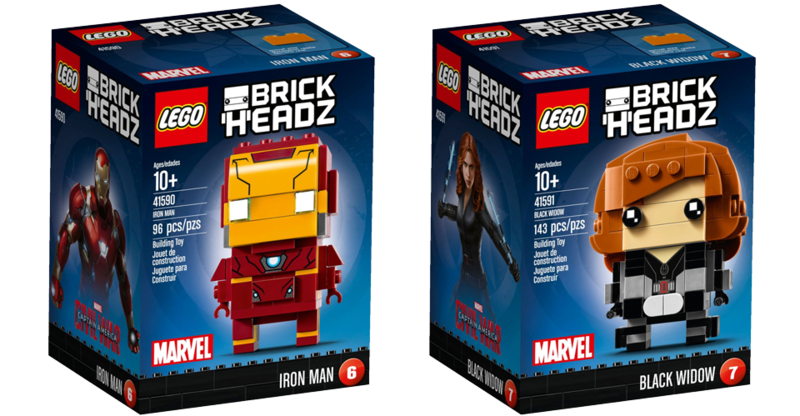 Getting six of them with Iron Man could prove useful when building in this increasingly prevalent colour. Nothing in Iron Man’s four exclusive printed elements is universally reusable unless you want to build your own Hulkbuster. 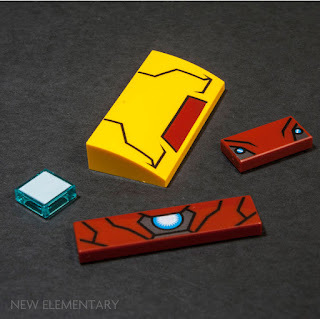 The pieces are Dark Red Flat Tile 1x2 with Iron Man detail (6188458), Dark Red Flat Tile 1x4 with Iron Man detail (6188715), Flame Yellowish Orange Plate W. Bow 2X4X2/3 with Iron Man head detail (6188122) and Transparent Light Blue Flat Tile 1x1 with a white printed square (6179033). The latter, which is used for Iron Man’s eyes, has a little more potential. As you may have guessed you get two (plus a spare), and I don’t have any particular idea in mind for it at the moment, but I am sure it will find its use some day. 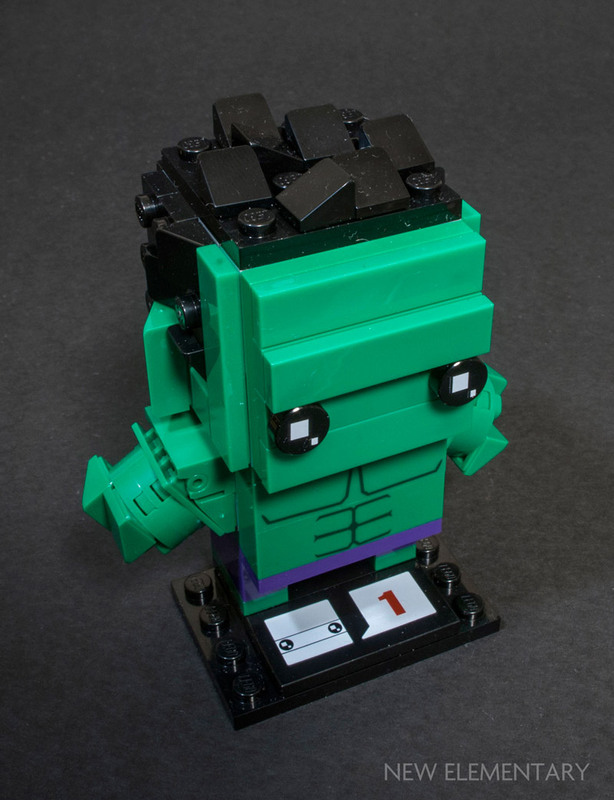 On to one of my favourite BrickHeadz characters. As soon as I first saw pictures of her, I jumped for joy as she brings us two curved slopes in never-before-seen Dark Orange! 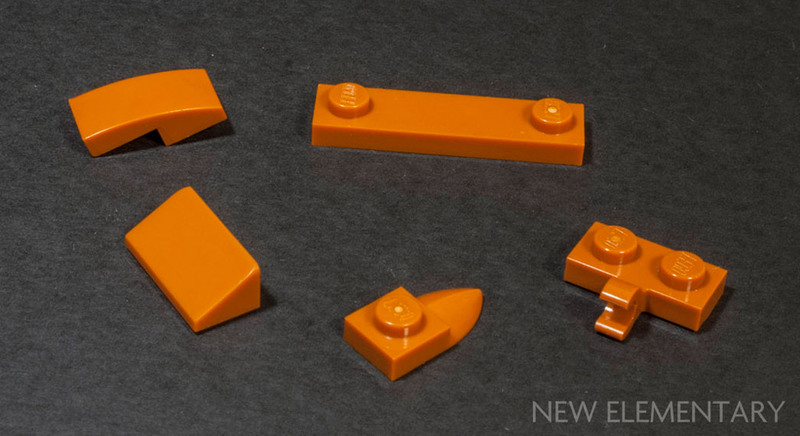 Almost as soon as we got these two slopes Brick W. Arch 1X1X1 1/3 (Design ID: 6091) and Plate W. Bow 1X2X2/3 (Design ID: 11477) in Medium Nougat, the colour’s next door neighbour Dark Orange comes along to follow in its steps. 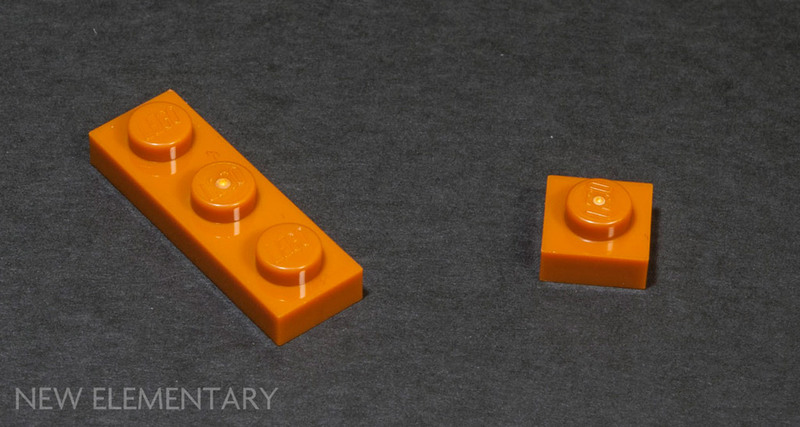 The two colours are quite similar, with Dark Orange having a slightly more reddish hue. Black Widow comes with generous eight (6186632|6091) and nine (6186009|11477). Curved slopes are not the only new thing she gives us in Dark Orange. 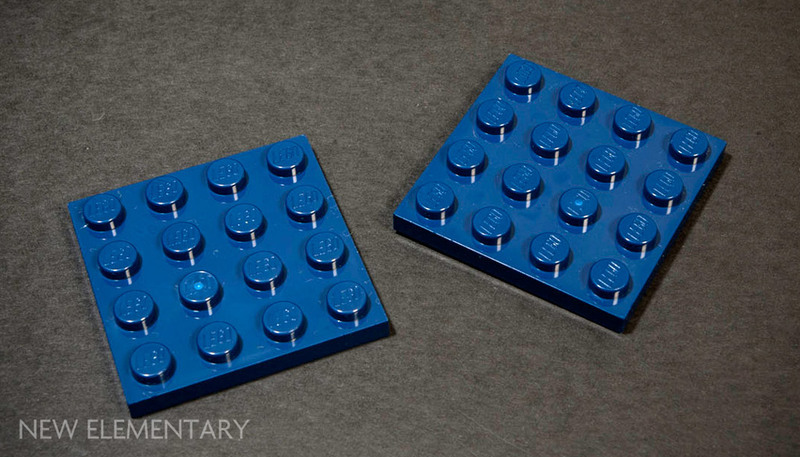 There are four (plus a spare) Plates 1x1 (6186012|3024) and six plates 1x3 (6186007|3623) included. 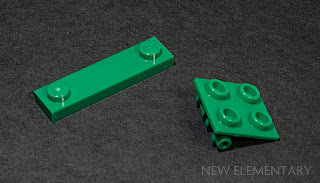 Having small plates available, especially 1x1s in any specific colour is absolutely essential for building. 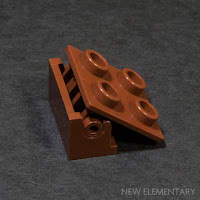 As anyone who ever made the mistake of trying to build a structurally sound creation using only even-studded bricks or plates would tell you, you really need those 1x1s and 1x3s. 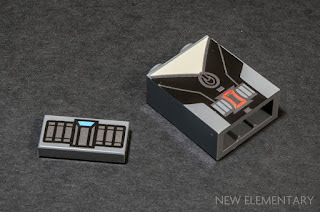 Her exclusive printed elements consist of one Brick 1x2x2 in Dark Stone Grey [TLG] / Dark Bluish Gray [BL] with Black Widow torso detail (6200759) and two Flat tiles 1x2 in Dark Stone Grey with her sleeve detail (6188469) which are easily re-useable as some type of mechanical decoration. Although part selection is highly subjective to your personal needs, this is the best set in the series to get for parts in my opinion. 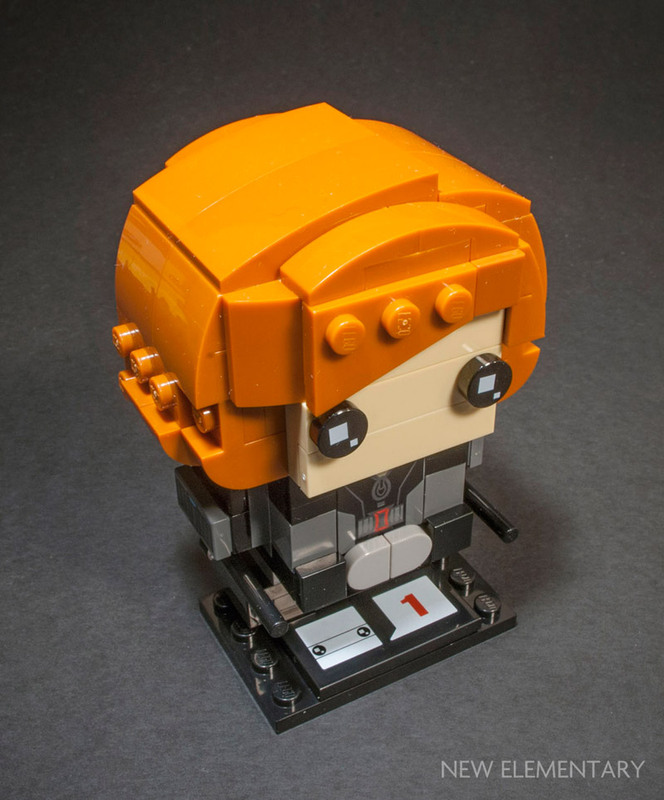 Her piece count is 143 elements which is only second to The Joker from this series, and she comes with a large array of both new and old plates and slopes in Dark Orange. 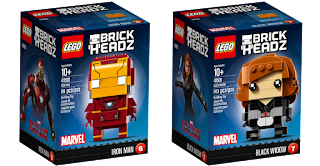 There are no large quantities of a single brick, but I am already planning to buy a couple more Black Widows when they hit the market, mostly for all the cool bricks. If you are impatient to see more new Dark Orange elements introduced in this series, skip down to the last character 41596 Beast. Our next character owes its slight disappointment in new and interesting elements to mostly being composed of the ubiquitous shade of Dark Green [TLG]/ Green [BL]. But maybe this series is beginning to spoil us, two new recolours in such a small set is still fantastic. One of them is Plate 1X4 W. 2 Knobs (6186616|92593) and the other is Plate 2X2 (Rocking) which will allow us to build more inconspicuous hinged constructions in that colour. 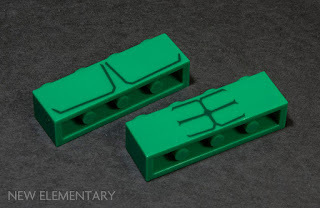 The Hulk comes with two of the accompanying Dark Green hinge bases (6170765|3937) to form a pair of complete hinge assemblies in Dark Green - used here for his shoulder joints. The hinge base isn’t new in this shade, but hasn’t been seen since 2004. Its re-introduction just slightly preceded this set, in 70903 The Riddler Riddle Race earlier this year. Hinge elements in green are always useful for building trees and foliage at an angle. Hulk’s exclusive prints include two different 1x4 Bricks in Dark Green with different muscle outlines, (6188695) and (6188692). Speaking of hinges, our next character - from the Disney range of BrickHeadz - gives us some more new recolours of the aforementioned hinge. 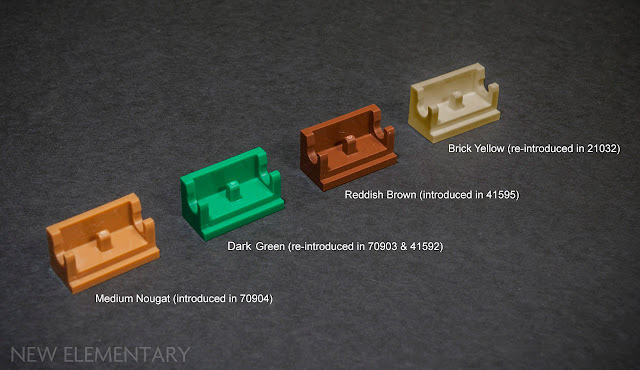 Her only recoloured element is the “hinge base” Rocker Bearing 1X2 (6186045|3937), this time in Reddish Brown! Unlike its top counterpart, the hinge base was never available in brown, even in the old retired shade. Some hinge elements designed by TLG, such as the 'finger style', have been retired since their initial introduction and replaced with a redesigned system. This was, in most part, in order to reduce their susceptibility to wear and cracking over time. However, this hinge assembly has been with us unchanged since 1979, so it comes as great news that it’s finally been given some more colour choices. 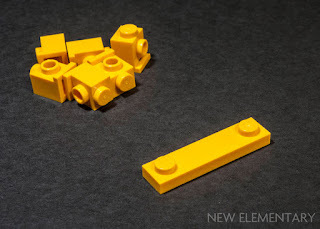 If we take into account the recently re-introduced hinge base in Brick Yellow[TLG]/Tan [BL] from another 2017 set, this gives us the fourth colour in which this element was either newly introduced or brought back from dead this year. 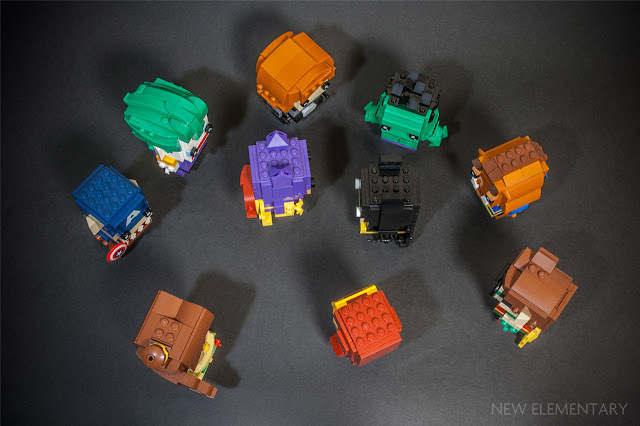 The accompanying top piece (6167644|92593) was also introduced in Reddish Brown this year in 70904 Clayface Splat Attack (read my review here), and is now also included with Belle. 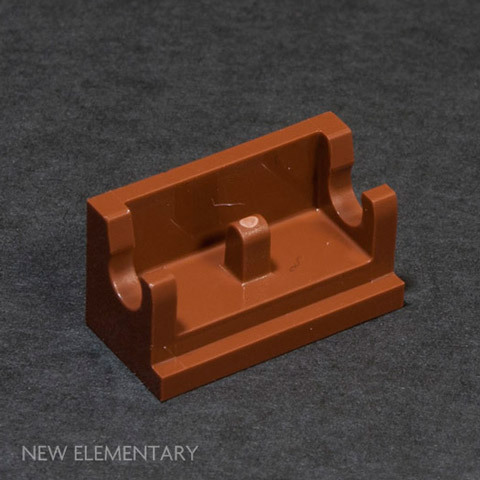 Unfortunately, there is only one piece of each in Belle, but at least you can make one complete Reddish Brown hinge assembly from this set. Belle brings some new recolours I have already described in other Brickheadz characters such as Plate 1X2 W. 1 Horizontal Snap (6179329|11476) in Bright Yellow (seen in 41586 Batgirl) and Plate 2X2X2/3 W. 2 Horizontal Knobs, (614301|99206) in Reddish Brown (seen in 41587 Robin). 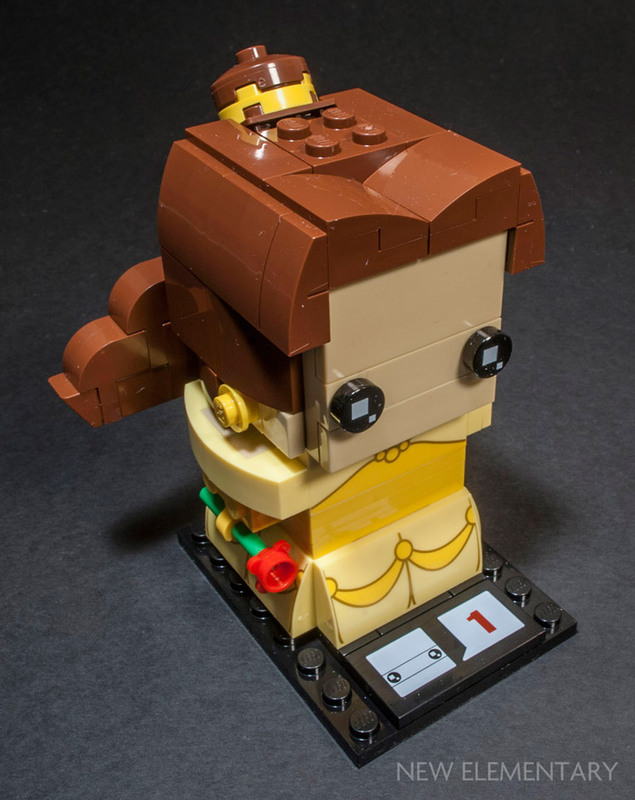 Belle is the only BrickHeadz character with a larger base. 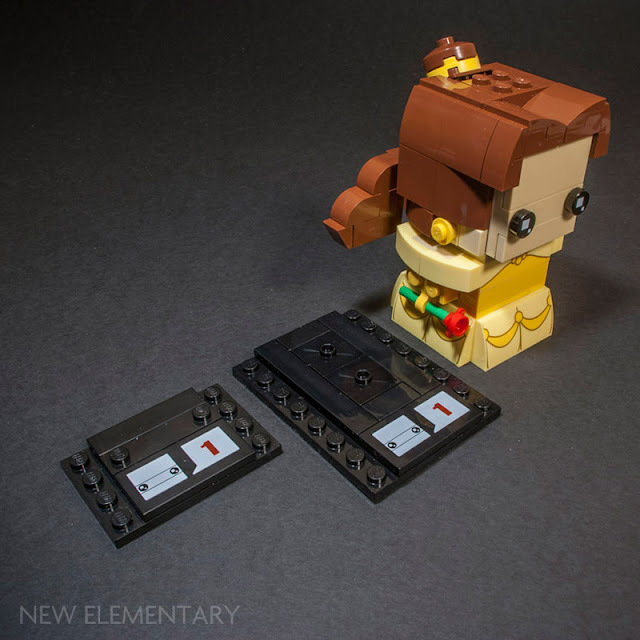 Her plate is 6x8 studs which is double the size of other characters - something that could give a certain sort of collector slight brain itches in case they were planning to display them in any set of consistent compartments. Her exclusive printed elements are one Cool Yellow [TLG]/Bright Light Yellow [BL] 1x4 Brick with her dress decoration (6188699) and four Plates W. Bow 2X4X2/3 with her dress pattern (6188184). Both elements could easily be reused as any curled yellow fabric with fancy decoration. Belle’s companion is our last character (for now) and he brings us some more exciting Dark Orange elements. Roof Tile 1 X 2 X 2/3 (6188477|85984) was previously available in Dark Orange in a 1x1 size, but now we get the double width “cheese slope” – four are included with Beast. Since this element is so conveniently named “Roof Tile”, it’s nice to get it in a colour which so closely resembles real roof tiles. We also got two Plates 1X1 W/Tooth (6186048|49668), one Plate 1X4 W. 2 Knobs (6186047|92593), and finally, the most recoloured element in this theme - Plate 1X2 W. 1 Horizontal Snap (6186049|11476) gets its Dark Orange version, which puts us at eight total new elements in this colour just from this theme. 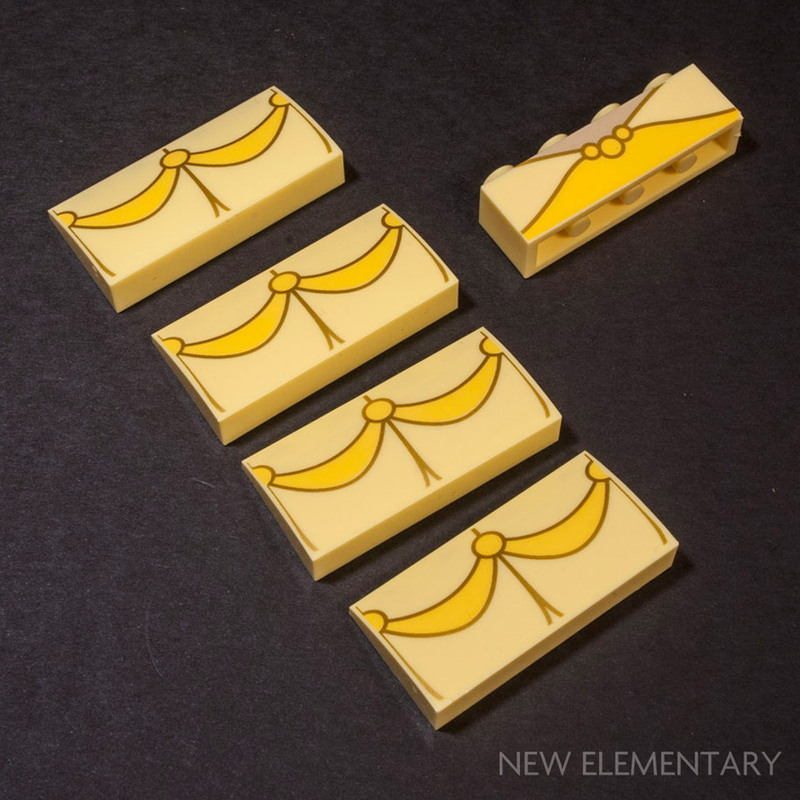 Plate W. Bow 1X2X2/3 (6186009|11477) was already mentioned in Black Widow, but Beast gives us just one more piece. Apart from Dark Orange elements, Beast also introduced a useful bracket piece Angular Plate 1.5 Bot. 1X2 ½ (6174856|99780) for the first time in Reddish Brown. 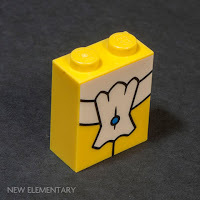 Beast’s exclusive printed element is just a 1x2x2 brick in Bright Yellow with his torso detail (6187661) – a slightly less reusable piece from the ones in Belle, unless you have a cartoony pirate in the making. 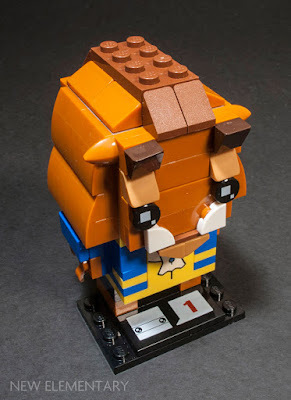 While LEGO minifigures never stop growing in popularity, I am hoping themes with buildable characters like BrickHeadz manage to steer some focus on building a collection of recognisable characters rather than just obtaining it. Whether you ultimately decide to collect and display or take them apart and build your own, knowing the potential is there feels more appropriate to the philosophy of a construction toy. I am eager to see what this theme brings us in the future, and indeed the new Pirates of the Caribbean BrickHeadz are revealed on the boxes of Belle and Beast! I am especially looking forward to rummaging through their inventories of exciting parts and colours. 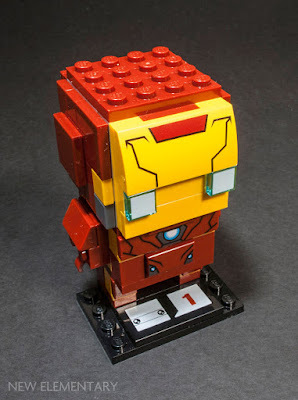 An idea for Iron Man's eyes, I imagine the print doesn't entire cover the whole tile. I'd imagine that with the spacing between two tiles, one could build a translucent floor and put lights under it, with the printing providing a cool silhouette. That'd require quite a few but I imagine if these things come with three, and if it gets used again later, or if someone gets a hold of a bunch, someone could make that work. I'm pretty sure this is the same print of a square on a tile as the one used for the doors of the Audi R8, 75873. Those aren't transparent, but they might make for a good chequered pattern. There's also a yellow one with black print in the Caterham. 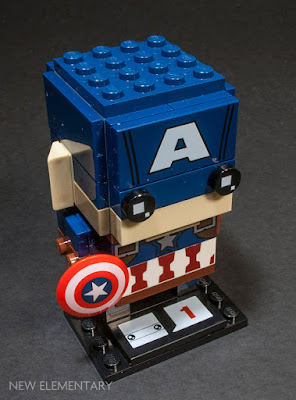 I imagine the clip on Captain America's back is placed so he can carry his shield there, as he often does in the films. I thought it might be. I tried to see if this is what he does, but couldn't find any concrete info. The reason Captain America likely has the second clip on his back is so you can display him with the shield clipped there like he often wears it in both the comics and movies. I've been trying to build BrickHeadz of other characters from the Lego Batman Movie on LDD and as such I hope that this series continues to introduce new colors of parts that are essential for these sorts of builds. 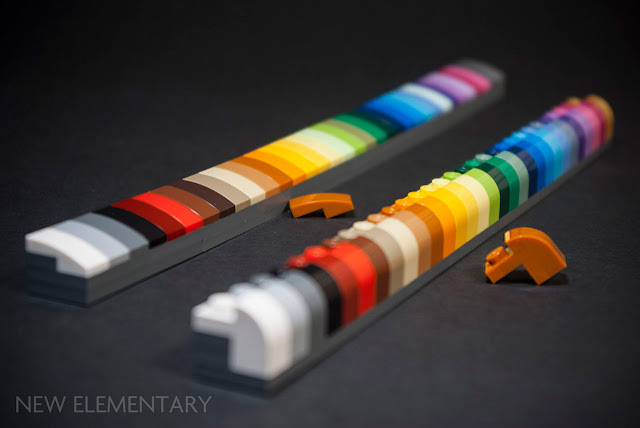 In particular, 11476 is a necessity for most figures and would be great to get in colors like Medium Lilac, Earth Green, and ESPECIALLY Medium Nougat (among many, many others). Seems like this part is at least coming in Tan with one of the next two characters.